How many opposition parties will get into the State Duma? With elections only a month away, pollsters predict that United Russia will win an overwhelming majority in parliament, a claim the opposition categorically rejects. The latest opinion polls show that more than half of Russians are still going to vote for United Russia, while the remaining six parties that have nominated candidates have the support of 40–45 percent of voters among them. Nevertheless, representatives of opposition parties are sure they will be able to give the “party of power" a run for its money. According to the latest poll from the Levada Center, 60 percent of Russians would vote for United Russia if elections were to be held today. A poll carried out by the Russian Public Opinion Research Centre (VTsIOM) gives United Russia 53.8 percent of the vote. In the opinion of Andrei Isayev, secretary of the presidium of United Russia’s General Council, most voters are ready to support “party of power” mainly because they want stability. “The opposition parties seek to overhaul the country’s political system. But then can one be sure that it will be possible to pay for a mortgage or a car loan?” said Isayev. The Levada Center predicts that only three parties will have full-fledged representation in the Duma – United Russia, the Communists and the Liberal Democratic Party of Russia (LDPR). Isayev believes these three parties send a “clear and understandable message to the electorate.” “United Russia is a centrist party, the KPRF is the left-wing opposition and the LDPR is the right-wing opposition, with a nationalist tinge,” said Isayev. The opposition does not share this view. “In our opinion, four parties, including Just Russia, will manage to establish a credible presence in the Duma,” said Obukhov. Gudkov also believes that his party will make it into the Duma. The latest VTsIOM poll supports his claim, giving Just Russia 9.4 percent of the vote – well above the 7 percent required to enter the Duma. The chances of other liberal parties making it into the Duma are still slim. Polls show that Yabloko, Right Cause and the Russian Patriots are unlikely to make it over the barrier. 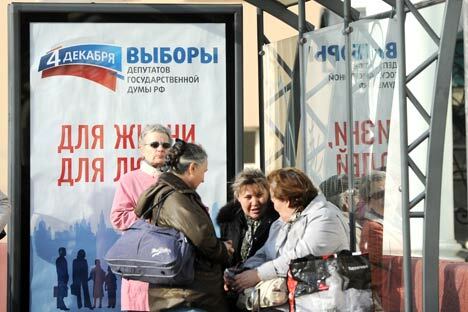 Opinion polls have also shown general apathy among Russians with regard to the elections. According to VTsIOM, 36 percent of Russians are sure they will go to the polls, another 39 percent “will probably” vote and 11 percent said they will stay away. Isayev thinks this is quite normal. “As the political system becomes more stable, fewer people will be interested in politics,” he said.